Lighting Wholesaler Australia is a wholesaler from manufacturers / importers which translates to lower pricing due to no ‘middle man’ distributors. All products sold by Lighting Wholesale Australia are backed with local warranties. To find out more, please click here for about us. Lighting Wholesaler Australia strives for customer services and aims to build relationships with customers of all means, that’s why we offer samples to all new customers at wholesaling prices for you to evaluate and test our products. To request product samples, please click here for a simple sample request form. Lighting Wholesaler Australia has direct control over our manufacturing processes and is more than happy to provide tendering agreements as well as project based quotations with products built to your specifications. 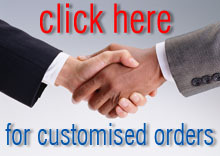 To make a customised request, please click here for customise order form.